Once upon a time male duos were a part of the soul landscape all over the US. Every town seemed to have its own Sam & Dave. I love this style of singing – even though it is now so totally out of fashion has to be prehistoric. 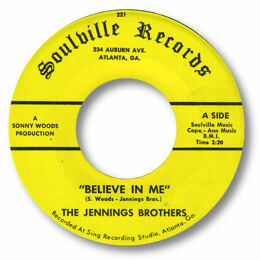 Believe In Me has a charming simplicity about it, a superb chord structure with the bare arrangement underneath an alternate harsh and soft vocal. But the big sting is in the fiery testifying at the end. It certainly had enough going for it to be picked up by Atlantic for national distribution. Please note also the excellent cut of this tune by Dee & Lola.